I’ve been keeping a secret from you. I’ve signed up to do a Mini Triathlon. Please stop laughing. Or gasping. I will tell you that I didn’t go about this on my own. You see, I have sporty friends who are all about working on their fitness. I am aware I need new friends, but until then I am stuck doing physical activities. Because I can’t say no. And also because I have an annoying affliction where I am worried I will miss out on ALLTHEFUN. Clearly I am aware that there will be no fun on that triathlon day. Yet still. What IF? Anyhow, the event is in September. And my husband has started asking me when I’m going to start “training”…which isn’t annoying at all. But I am happy to say that I have made the first step in race preparation. Also, sports bras are annoyingly expensive and OMGuncomfortable. Like running isn’t painful enough, I now have to have an undergarment hanging onto all my bits and pieces for dear life, as well? Apparently if my friends jump off a bridge, you can guarantee that I won’t be far behind. Luckily I never became friends with hobos. So while I procrastinate my “training” I made some Homemade Payday Bars. She is clearly trying to sabotage me. 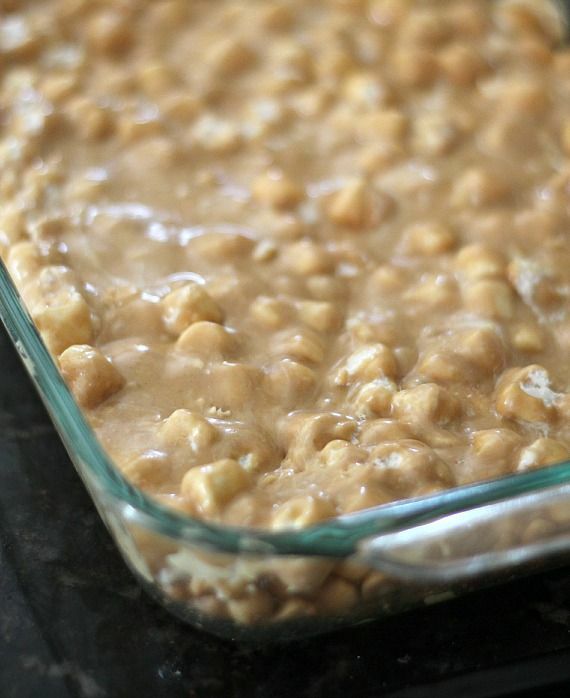 They’re a no-bake dessert..actually you just need a microwave. Start with a greased 9×13. 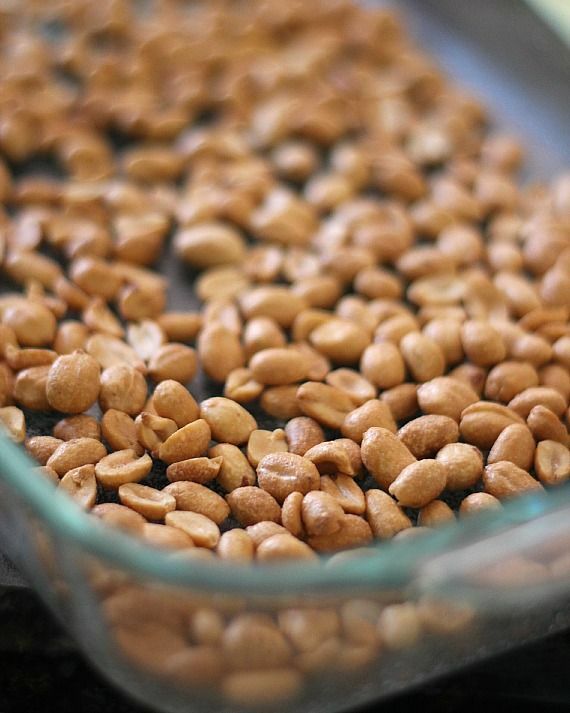 Layer half your peanuts on in the dish. Stir that in and then add your marshmallows. Press the remaining peanuts into the marshmallow mixture. Sprinkle some flaked sea salt on top and let them chill for a bit before cutting into squares. In a large microwave safe bowl, heat peanut butter chips and butter in 30 second increments on 50% power. Stirring after each until melted. 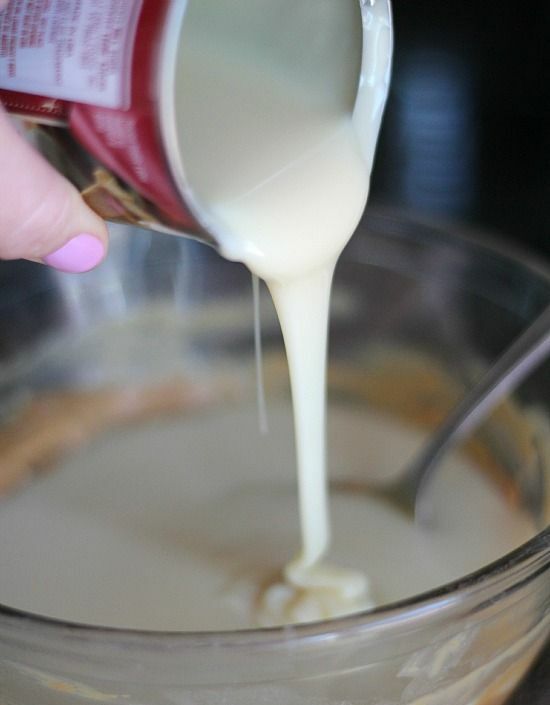 Pour in you sweetened condensed milk and microwave on high power for 1 more minute. Stir until smooth and combined. 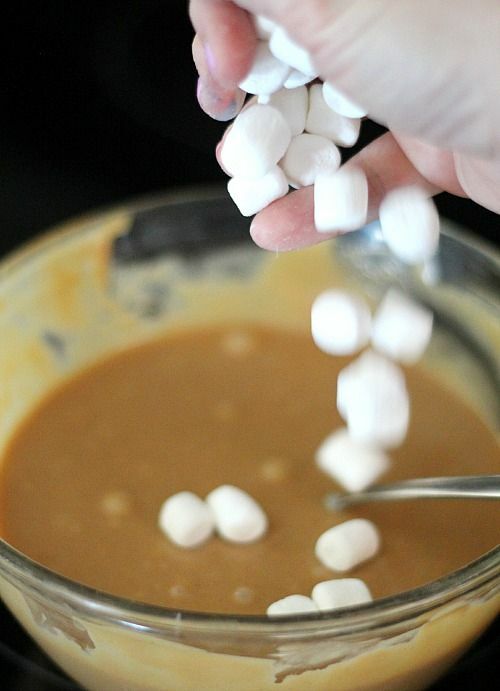 Fold in marshmallows to peanut butter mixture until evenly coated and then pour over your peanuts in the pan. Press the remaining nuts into the marshmallow mixture. Sprinkle with flaked sea salt and chill for about an hour. recipe from the kitchen of Angie Bonfanti. I made homemade Payday Bars in December! It was right before xmas and knew I ‘should’ be making xmas cookies but made these instead. I loved them and love your version and the handwritten recipe. Congrats on the mini tri! They’re fun and way more do-able than a full tri and that is so awesome!! Oh lord have mercy. Better you than me. But you are certainly a good friend. I choose not to have sporty friends. 😉 They make me tired. These looks awesome! I am on a sweetened condensed milk kick so these are perfect!! 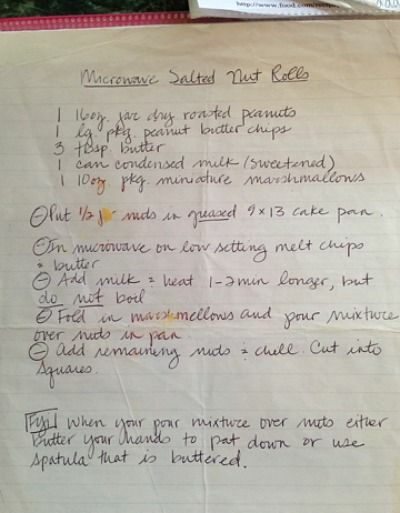 Love the cute handwritten recipe! Congrats on the tri! You will do awesome and it gives you an excuse to eat more of these bars!! Darn those sporty friends! In all honesty, I think you’ll have a blast! I’ve not yet made homemade Paydays but these look so yummy, and super easy! They may just be in my near future! Ok, first of all – YUM! These look AWESOME! Paydays have always been one of my favorite candy bars! I used to trade for them at Halloween with my siblings. 🙂 My son only recently discovered the joy that is a Payday (and he’s almost 20!! Wait, did his mom always eat them out of his Halloween stash…? ), and I’m totally making these for him! I just recently got suckered into, I mean, signed up for a 5K. Yikes!! But, mine is in about a month! One of the things on my to-do list for this week is buy a sports bra. 🙁 I KNOW you feel my pain! These look delicious! Love Payday bars! And I love how easy these are! Perfect for a quick dessert. One of my favorite candy bars! I am so excited for you! Okay, so it may not seem like “fun” in the traditional sense, but I guarantee that you will experience such a feeling of accomplishment and well-being that you might even find yourself trying to convince others how much fun it is. And these bars…yep, that’s what I call a good training treat. Ohhhh, my neighbor used to make those. Sooo good. And I am sorry you are going to be chased by zombies as that is the only time I will run. My mom loves Payday bars so I have to make these for her! And good luck with your mini triathlon! A triatholon?! How fun! I’ve always wanted to do that! And these bars – yes please! I’m not much of a payday person but I’d gladly devour these! Sooo dangerous! I love how easily these come together. Oh god I need these. Are they normally made with peanut butter in the middle, I thought it was caramel? I think yours are far superior! LOVE how easy these are! I made something similar during the holidays a few years ago, but this recipe is even easier. Love it! 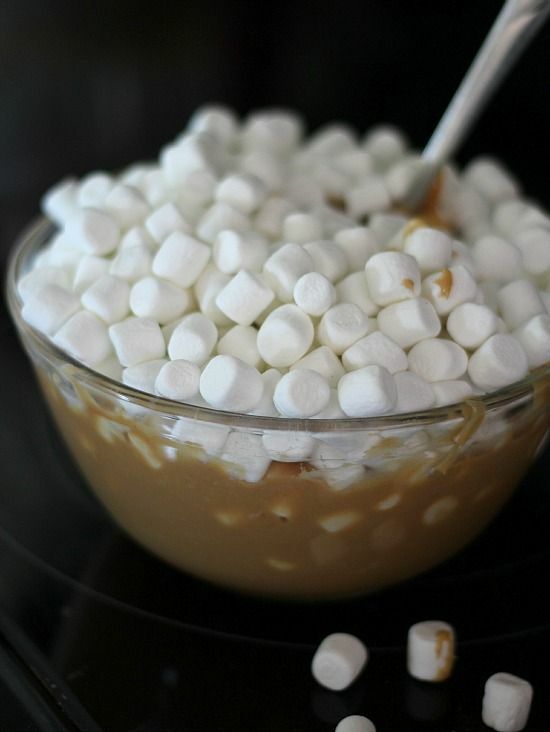 Can you taste the marshmallow in this recipe? Ugh. My triathlete fiancee tricked me into doing a mini tri last weekend. I run almost every day and swim regularly, but I hadn’t been on my bike in over a year. If he had given me some warning about the race, I would have at least done SOME bike training, but I had absolutely none. And it showed. The swim and run went great, but I got passed by over half of the field on the bike. They write your age on the back of your leg (tell everyone why don’t you) and I kept getting passed by people would could have been my mother, grandmother, great-grandmother…. Anyways, as long as you train (and it sounds like you’ve got great workout buddies), I just know you’ll do great! Go Shelly! That is exactly how I found myself signed up for a Tough Mudder a few years ago…turns out it was actually way more fun than I anticipated. You will do great!!!! Clearly your friend is trying to sabotage your training because there is no way I could stay out of these bars!!! Holy yum!!! OMG I love Pay Day!! When I was training (ha, love you) I craved Pay Day like nobody’s business, and I haven’t eaten one in years! Needless to say my fingers were cramming quarters into the vending machine in my apartment building as soon as I saw them in there. But I am so excited for you and your mini tri! And your new sports bra (yes, yikes expensive!)! Can’t wait to hear the updates on it! I’ll stay home and make the Payday bars. You go run, etc. LOL! These were my favorites once upon a time. Now I try to find the mini ones around Halloween. You have given me an excuse to try these out. I actually have this same recipe from my husband’s aunt. And they are AH-mazing! Sometimes (in warmer weather) I can’t get them to set up so I just throw them in the fridge for a few hours. YUM! Good luck on the “training”! I hate sports bras, I can never find one that actually works that doesn’t cost $80! This is one of my husbands favorite candy bars, definitely going to have to make them for him! #1, Godspeed on that mini-triathalon! You are a brave soul. #2 Paydays are so underrated! I’m so in love with them. Good luck on the tri hope you do well. These payday bars sound yummy, I just love payday’s. We have one that is even easier and you can carry it with you where ever you go um or run. You mix dry roasted peanuts and candy corn together in a zip lock bag and eat it on the go. We call it corn salad, cause, well it sounds healthy sort of. These look amazing! I never really eat Paydays because, you know, no chocolate! I will definitely be trying these though. Congrats on the tri! I’m training for a half marathon right now and it helps me eat more ‘fun’ foods! Did my 1st tri last summer. Totally fun and scary! Is it an open water swim? Practice if so! Train. Bake. Repeat. Woohoo! I want to eat the whole pan 🙂 Looks amazing! These look amazingly sweet and salty! 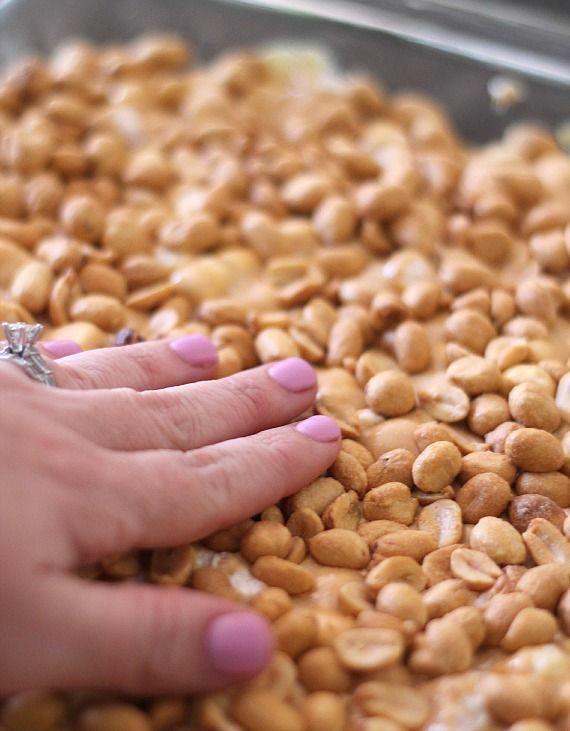 I need to make these for all of the old men at work who like to have beer and peanuts every night! Call me a sadist but I am SO excited for you! Of course…that’s coming from a three time marathoner…so yeah. I bet you’ll love it though. Afterwards. No one ever loves it DURING the event. But the afterward is so awesome. I made a homemade payday bar eons ago (I’m sure the photos are atrocious), but they really spread after I cut them. Still tasted great but not so presentable. These look wonderful! Those look incredible! And good luck with the mini- marathon! Yay! More candy bar bars! And good luck with the triathlon! Ohhhh boy. This recipe is going to get me into some serious trouble in the skinny jeans department. I have this exact same recipe that I posted back on December, 2011 on my blog. I got my recipe from a dear friend years ago except mine used the stove top and not the microwave oven. I found it interested that there has been recent surge in traffic to my post about them. I always wonder about such things. Glad to know that yours were just as tasty as mine. Yours look yummy. Good luck with your triathlon. Hello from Chile!! I have a question… here we don´t have peanut butter chips… can I replace them (and the butter) with normal or chunky peanut butter? I hope you can help me… these bars looks amazing! You could do that, but they won’t set up as firm. 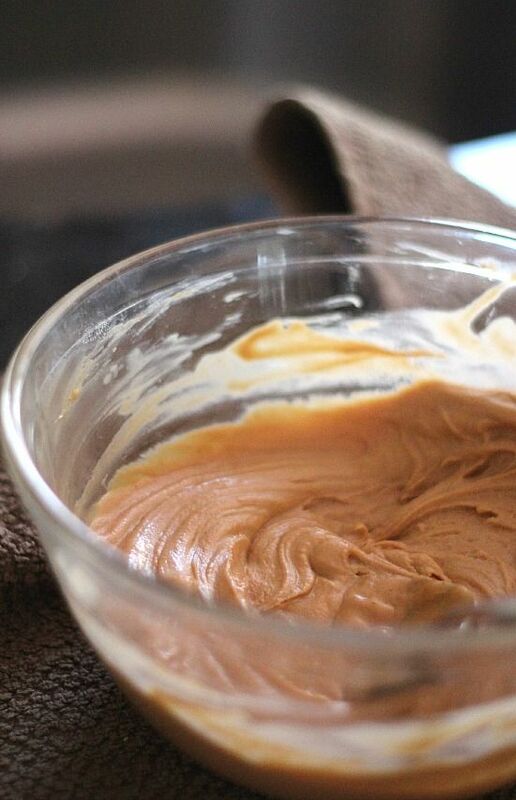 You could add some white chocolate with your peanut butter. Where do we buy peanut butter chips in Australia? never seen them could you use normal peanut butter? 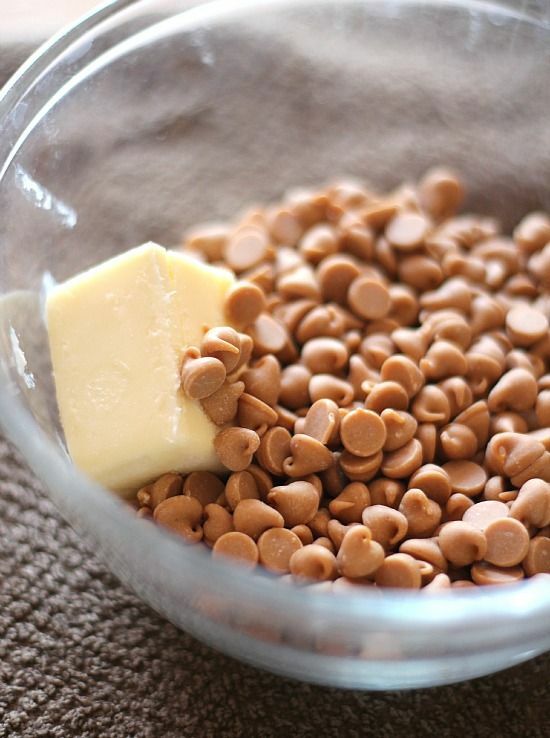 I wouldn’t use normal peanut butter only.. maybe mix it with some white chocolate so it sets up better. peanut butter only won’t set up. Maybe you could try ordering online? I am making these for the BAJILLIONTH time! Always a hit and so super easy! Love hearing this!!! Thank you! Has anyone tried making these with peanut butter instead of peanut butter chips? I’m out of the chips so I’m wondering if I can substitute just peanut butter. I’m so excited to make these for my dad’s birthday!! How do you recommend storing them? ?